Vinegared rice topped or combined with items such as raw fish, shellfish, or thin strips of egg is called sushi. Served in restaurants and sold at supermarkets and take-out shops, sushi can also be prepared at home. There are many regional varieties. The idea for sushi was introduced from China in the Yayoi period (ca 300 BCE - ca AD 300) as a method of preserving fish by fermentation. However, it was not until the early nineteenth century, in Edo (now Tokyo), that fresh raw fish was served on freshly cooked vinegared rice. 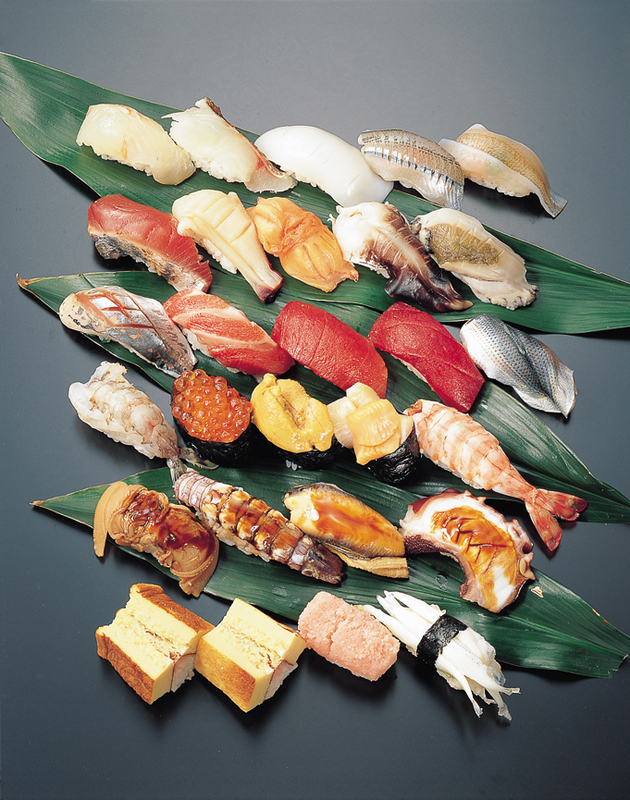 The original types of sushi were called nigirizushi (握り寿司 にぎりずし hand-pressed sushi) or edomaezushi (江戸前寿司 えどまえずし). Today there are also variations of sushi called makizushi (巻き寿司 まきずし rolled sushi), chirashizushi (ちらし寿司 ちらしずし "scattered" sushi), oshizushi (押し寿司 おしずし pressed sushi), and each area of Japan has its own variation of sushi. Sushi usually has the image of being high-priced, but recently, families and young people have begun to enjoy kaitenzushi (回転寿司 かいてんずし) restaurants where the sushi is served on a rotating counter, and customers pick what they want; the bill is determined by the number of sushi consumed.